O.C. History Roundup: Join us for "Show & Tell"
Join us for "Show & Tell"
So,... What are you bringing to Show & Tell this Thursday? Because you are invited, after all! As you may have noticed in today's O.C. Register, the Orange County Historical Society will hold its annual Show & Tell Night this Thursday, Dec. 12, 7:30pm, at Trinity Episcopal Church, 2400 N. Canal St., in Orange. 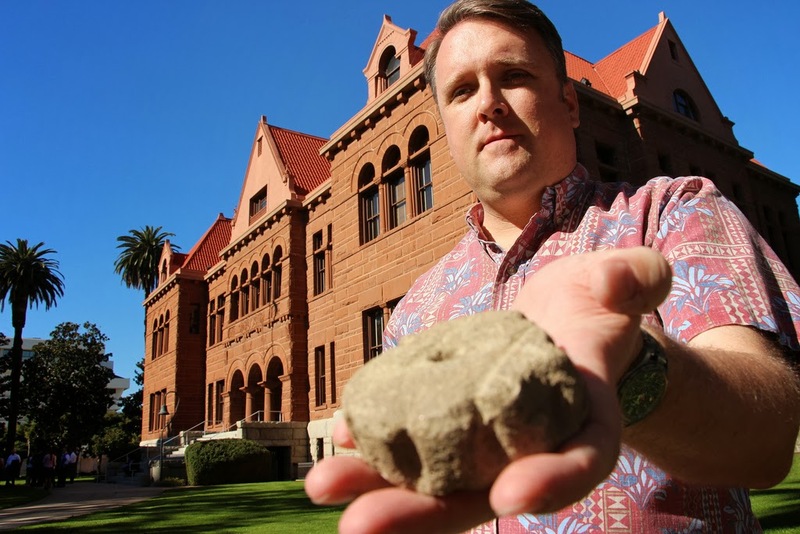 Rummage through your garage, files, scrapbooks, or trunks for a choice artifact or bit of memorabilia or ephemera that helps tell us something about Orange County of yore. Afterward, refreshments will be served and there will be an opportunity for socializing and seeing some of the night's interesting Show & Tell items up close. For more information about the event see the OCHS website. Hope to see you there! 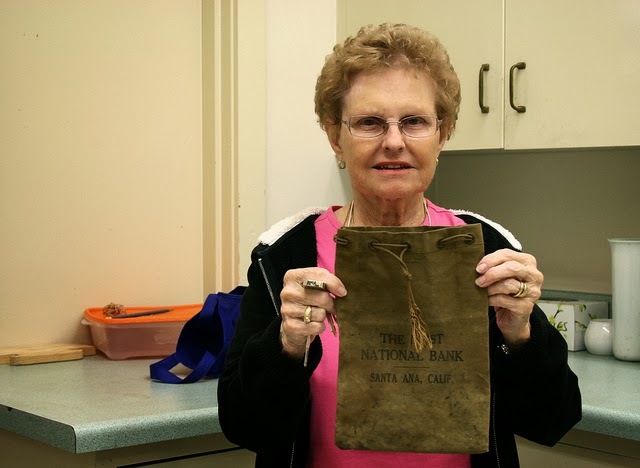 Judy Moore brought an item from First National Bank of Santa Ana to 2011's Show & Tell. OK, thinking about coming to the show and tell. How about some of OC's rare petrified wood? Or maybe you would like to see alump of coal from Carbondale. Or maybe a fire brick covered with white ceramic from an old dairy. Or a brass carbide miner's lamp from the Blue Light Mine. I'm leading a hike to the Blue Light Mine sometime next year for the OCHS. Who am I? Maybe you can show me where to find Carbondale coal sometime. I assume there are still mine tailings somewhere? Show & Tell is definitely NOT about selling, trading, or attaching values,... But personally, I would pay real money for such a miner's lamp. I know I'm a history nerd, but I find that enormously cool. Chris, the carbide lamp is on loan to the Maple Springs Visitor Center. The coal and petrified wood are here at my home, as is the brick (Jim Sleeper was into old bricks, by the way). Just a week ago I discovered an 80 pound chunk of petrified wood just a few blocks away from the Mission Inn in Riverside. It's still there. As a Native Orange County Boy (N. Tustin and Dana Point) and avid Tikiphile, all I can say is that I am sorry that I didn't know about your blog before I moved away from California. Both of your blogs are really good. Chris, That is quite a gem that you are holding in your hand. Even more holiday historical happenings!